Although it does feature evil stepmothers, wild stepsisters, and fairy godmothers, Cinderella Waltz happens to be worlds apart from the familiar children’s tale. Cinderella Waltz was presented from March 8 to 15 at the Laura C. Muir Performing Arts Theatre by the Douglas College Departments of Theatre and Stagecraft and Event Technology. The entire play is extremely comedic and features high-scale dramatics acted by the cast. I will say that at first I was put off by it. It felt as though I was watching a strange and obnoxious children’s cartoon with all the fainting to the floor. By the second half, however, I grew used to it and was impressed by the actors’ abilities to immerse themselves so thoroughly into the play. Of course, to be annoyed by a character means that the actor is doing an amazing job! They put their all into the performances and it showed. There are a lot of characters onstage for most of the play, oftentimes engaging in their own separate conversations. Occasionally they cut each other off as well. This threw me off a bit because it made the more important storylines harder to follow (let alone distinguish what they were, besides the obvious Cinderella one). 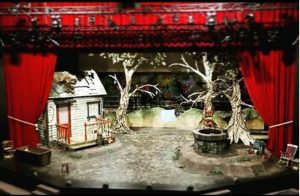 The Douglas Theatre Department’s production continued the children’s cartoon vibe, but in a more positive way, with some of the outfits, props, and lighting. At one point stepsister Goneril (Ellen Wakely) exclaims, “We look like a bunch of carnival clowns!” and she could say that again. All the characters donned makeup to bring out their features such as pink circles on their cheeks, lines under their cheekbones, or high eyebrows. They were all dressed differently as well. Goneril sported a typical “emo,” style with all black and heavy eyeliner; her sister Regan (Aysia Ledoux) was adorned with a pretty pink princess look; and my personal favourite, Troll (Ian Duck), wore a flamboyant, light blue suit with a yellow shirt, purple tie, knee-high white socks, and large elf ears. He also played a kazoo every now and again. The lighting and set design overall were nothing short of spectacular. 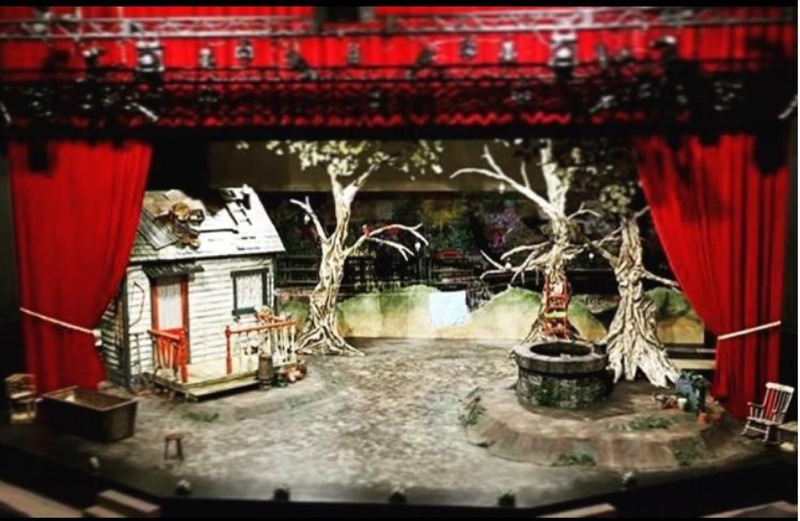 A small house was built on the left side and the rest of the stage had scattered trees and a well, among other props. The backdrop was lovely as it displayed the passage of time through sunrise, day, and nightfall gradients. Nighttime itself was beautiful: Glowing lanterns turned on, the leaves on trees grew, and a crescent moon fell in front of the backdrop. The mystic colours of the physical set paired with the lighting and colours of the characters’ outfits made me feel as though I were transported into an Alice in Wonderland-type of world. This play was a success with all its flair, and I appreciate the constant push of boundaries. The actors in Cinderella Waltz are soon ending their time in their respective Douglas programs, but this play was a fantastic last hurrah!